It appears, however, that this deal has also cleared the boards for BP to work with Gazprom to bring Russian natural gas to Great Britain. AAR had previously taken the position that their partnership with BP mandated all BP business opportunities in Russia be run through TNK-BP. With all claims settled, sources report that the consortium has relinquished all claims on BP’s future Russian activities. That could include moving into the natural gas market. Gazprom’s Chief Executive Alexi Miller reported in June that BP was interested in participating in an expanded Nord Stream pipeline, one that would carry product to Britain. Such a move is a questionable investment decision by the British company, given the plummeting price natural gas is commanding, and the large quantities of liquified natural gas (LNG) coming on the market to compete with pipeline gas. With the recent decision of OAO Rosneft to purchase TNK-BP from its various owners, one of the most strained partnerships in Russian economic history comes to an end. Rosneft has agreed to pay a total of $54.8 billion to BP plc and the Alfa-Access-Renova consortum (AAR) controlled by four Russian billionaires. These oligarchs–Mikhail Fridman, German Khan, Viktor Vekeselberg and Len Blavatnik– defied the stated policy of the Kremlin last year to prohibit BP from entering into an artic exploration agreement with Rosneft. With ill feelings all around, it was apparent that this business union was headed for a divorce. 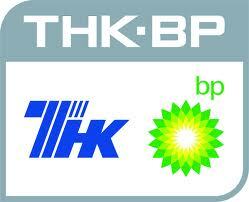 Initially, AAR offered to buy BP’s 50% ownership in TNK-BP, but this offer was withdrawn when Rosneft offered to purchase AAR’s shares instead. AAR is slated to receive $28 billion for it’s half of the company. Rosneft then offered BP the chance to sell its shares, as well. Anxious to raise capital to pay its Gulf spill-related expenses, BP agreed to accept $10-$15 billion in cash,and a 12.5% share in Rosneft. BP plans to use part of the cash payment to purchase an additional 5.66% of Rosneft which, combined with the 1.5% share they already hold, will bring their share of ownership to approximately 19.75%. 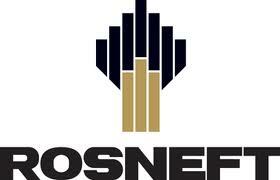 75% of Rosneft is owned by the Russian state, while the remainder is sold in the market. Analysts believe that the majority stock holder Russian state will help finance the purchase. “For Rosneft to buy both AAR and BP to form a fully state-owned oil champion would be the cleaner solution for the Russian state, and is likely to require further state injection into Rosneft, given that the company had previously been sounding out the market for a loan to buy part of BP’s share,” said RBC Capital Markets Corporation’s Peter Hutton. Not as much cash is required for the deal as the original figures would indicate, since BP and AAR are owed about $2.5 billion in dividends from TNK-BP. According to journalist Paul Whitfield, this means the cash proceeds from the two deals are actually $26.75 billion for AAR and $15.85 billion for BP, falling to $11.05 billion for BP after its acquisition of Rosneft stock. Russian President Vladimir Putin appears happy with the deal. “This is a very good signal for the Russian market. It is a good, large deal. I would like to thank you for this work,” he told Rosneft CEO and longtime ally Igor Sechin. Putin should be happy: the deal gives Rosneft a seat on BP’s board. This will give Russia a voice in BP operations outside of Russian territory such as in the Caspian where BP is the lead oil company. The deal puts Rosneft ahead of Gazprom as the leading energy producer in Russia. After the deal is consummated, Rosneft will produce 4 million barrels of crude oil a day. This does not appear to be the result of any inside-Kremlin politics, but economics. As the price of natural gas declines in the face of the shale revolution, it should be anticipated that Gazprom’s importance would also decline. Moscow needs revenues, however, and the price of oil remains high. Igor Sechin, driven out of the cabinet by former President Medvedev, is back in the cat bird seat. Against all expectations, Bulgaria has emerged as a key player in the battle for control of the Southern Energy Corridor. This Black Sea country is astride the most logical route between the gas fields and European markets for both South Stream and TANAP. Bulgaria has agreed to cooperate with both consortiums, while playing for maximum advantage. In August 2012, Bulgaria and Gazprom announced they would conclude an investment contract in November for the construction of South Stream. Simultaneously, Bulgarian Minister of Energy and Economy Delyan Dobrev announced a new gas-supply contract that featured an 11% price in gas for the remainder of 2012. The dispute has led to a delay in a visit by Russian President Vladimir Putin, who was supposed to be present in Sofia on November 9 for the signing of the South Stream papers. Instead, Putin has postponed his trip until December, possibly signalling his unhappiness with Bulgaria’s recalcitrance. 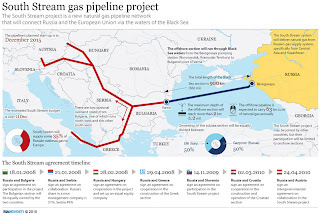 Meanwhile, in September 2012 the European Union criticized Bulgaria for supporting South Stream while lacking sufficient commitment to the EU’s version of a Southern Energy Corridor. The EU’s concern was that South Stream only diversifies supply routes from Russia, but does not diversify the ultimate, Russian source of supply. “Bulgaria needs to complete the ongoing investment projects on gas interconnectors with Romania, Serbia and Greece, and make reverse flows possible on its interconnector with Turkey…Bulgaria also needs to play a more proactive part in opening up the Southern Gas Corridor, which has the potential to diversify supply sources,” said a leaked document. Bulgaria must commit more thoroughly to the development of the EU-sponsored Southern Energy Corridor (also known as Southern Gas Corridor) aimed at diversifying natural gas suppliers to Europe, according to a leaked report of the European Commission. The draft report of the EC, which is still to be released, criticizes Bulgaria for throwing its weight mostly behind the Russian-sponsored South Stream gas transit pipeline, while lacking sufficient commitment to EU’s attempts to develop the Southern Energy Corridor, EurActiv reported Tuesday citing the leaked report. Bulgaria needs to complete the ongoing investment projects on gas interconnectors with Romania, Serbia and Greece, and make reverse flows possible on its interconnector with Turkey, the EU executive says. “Bulgaria also needs to play a more proactive part in opening up the Southern Gas Corridor, which has the potential to diversify supply sources,” the paper reads. The Southern Gas Corridor is a key element of competing projects to bring natural gas to Europe from the offshore Shah Deniz II field in Azerbaijan. Up to now, Bulgaria has made commitments to South Stream, a Gazprom-favoured project widely seen as a competitor to the Southern Gas Corridor. The South Stream pipeline is intended to transport up to 63 billion cubic meters of natural gas to central and southern Europe, diversifying Russian gas routes away from transit countries such as Ukraine. The pipes will go from Russia to Bulgaria via the Black Sea; in Bulgaria it will split in two – with the northern leg going through Serbia, Croatia, Hungary, and Slovenia to Austria and Northern Italy, and the southern leg going through Greece to Southern Italy. Recent reports have indicated, however, that Russian energy giant Gazprom may give up on the construction of the offshore section of the South Stream gas pipeline to Austria. The Black Sea underwater section of South Stream between Russia and Bulgaria will be 900 km long, and will be constructed at a maximum depth of 2 km. 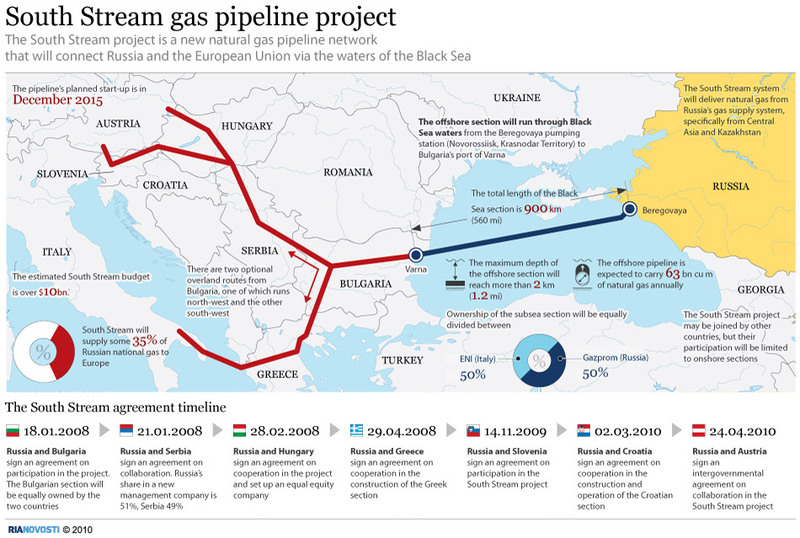 The construction of the South Stream gas pipeline will begin in December 2012, and the first supplies for Europe are scheduled for December 2015. The pipeline’s core shareholders include Gazprom with 50%, Italy’s Eni with 20% and Germany’s Wintershall Holding and France’s EDF with 15% each. Gazprom has already established national joint ventures with companies from Austria, Bulgaria, Croatia, Slovenia, Greece, Hungary and Serbia to manage the onshore section of the South Stream pipeline. Bulgaria has committed itself to speeding up the construction of the Russian-sponsored pipeline on its territory, since on January 1, 2013, the EU is introducing new requirements for the access to energy networks. 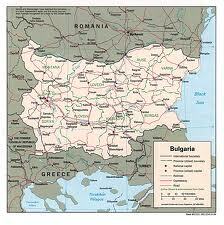 In the draft gas supply report of the EC, Bulgaria is also urged to increase cross-border network capacity. Regardless of its more favorable geographic location, Bulgaria is also singled out as one of the energy infrastructure black spots on the EU map. Despite any agreement with Nabucco, however, as of 30 September 2012 there was no agreement between Bulgartransgaz and Turkey’s Botas to connect with the Turkish pipeline network. Without such a connection, any discussion of Tanap or Nabucco is moot. To give the country some negotiating room, Bularia delayed its plans one year to connect its gas network with neighboring Balkan countries. Bulgartransgaz announced the connection would take place in 2014, instead of the originally-planned 2013. Recent armed spats between Azerbaijan and Turkmenistan in the Caspian Sea placed the future of the Trans Caspian Pipeline in doubt, but European Union-backed talks in Ashkabat appear to have put things back on track. According to EU spokeswoman Marlene Holzner, the Turkmenistan Energy Minister Myrat Artykow and Azerbaijan Minister for Industry and Energy agreed with EU Energy Commissioner Gunther Oettinger that the project could be an important part of efforts to reduce Europe’s dependence on Russian gas supplies. Despite the expressions of good intentions, who moves first to make the pipeline a reality remains in doubt. Holzner said that the EU was waiting for a gurantee from Turkmenistan on supply (despite the fact that Turkmenistan President Gurbangulu Berdimuhammedov is on record as promising 40 bcm per year for the project). At the same time, she said that the EU would neither own the pipeline nor pay for it. For his part, Berdimuhammedov has previously said that while he would sell the gas to Europe, it would be up to the Europeans to figure how to get it from Turkmenistan. So, all good wishes aside, no progress appears to have been made other than to get the parties talking again. Turkmenistan appears to have turned its attention east, with most of its gas sales going by pipeline to China. For Azerbaijan’s part, the pipeline could be seen as either competition for its own future gas production, or for Gazprom’s South Stream. In either case, the benefits of a Trans Caspian Pipeline do not appear to be overwhelming. The one country that would benefit is Turkey, who would like to see Turkmen gas made available to expand the proposed TANAP pipeline. “With the TANAP project we have created a structure that will allow gas to transit across Azerbaijan and facilitate trade. This structure is also targeting Turkmen gas. We are seeking Turkmen gas,” said Turkish Energy Minister Taner Yilmaz. According to Gulmira Rzayeva of the Center for Strategic Studies of Azerbaijan, an expanded TANAP could increase Turkey’s chances of joining the European Union. “Turkey can achieve political gains with this pipeline; it can be an ace in terms of its European Union membership negotiations. With the finalization of this project, Turkey will have a whole new position within the region.” Whether Turkey wants to join Europe is, of course, an open question. Turkey’s annual growth continues at around 7%, while Europe continues to stagnate and — possibly–sink back into recession. Despite support from both the United States and the Asian Development Bank, potential investors are backing away from the proposed Turkmenistan-Afghanistan-Pakistan-India (TAPI) natural gas pipeline. This proposal has been beset with concerns over security of the pipeline route, which passes through some of the most violent prone provinces in Afghanistan. In the latest development, China has expressed new interest in Turkmen gas. First, Chinese President Hu Jintao has proposed a new pipeline route that would bring Turkmen gas to China via Afghanistan. The benefit of this latest proposal is that the pipeline route would traverse a safer route in Northern Afghanistan. Second, China also signed in May 2012 an agreement with Turkmenistan to increase deliveries through the East-West Gas Pipeline from 30 bcm per year to 65 bcm. This pipeline does not pass through Afghanistan, has no security isues, and has been relatively trouble free since it opened in 2009. Finally, China has assured Turkmenistan that its demand for natural gas will constantly increase over the next five years. As a result, Turkmenistan’s enthusiasm has “softened” for TAPI, according to Pakistani correspondent Iqrar Haroon. The Russian National Energy Institute has recommended the Russian government should avoid investing in TAPI because of security concerns, and questions over the viability of the project. According to the Indian Institute for Defence Studies and Analyses, the proposed increases in Chinese purchases of Turkmen gas will have a negative impact on Russia. Turkmenistan offers lower-priced gas to China, bringing downward pressure on Russian gas prices. Russia and China have been in talks since at least June 2009 to import 68 bcm of gas per year, but have not been able to agree on a price. The Trans Adriatic Pipeline (TAP), the southern competitor for carrying Caspian gas from the Turkish border to Europe, has received an economic boost. British Petroleum and Total have signed an agreement with the State Oil Company of Azerbaijan (Socar) to fund the pipeline, designed to bring natural gas to Italy. 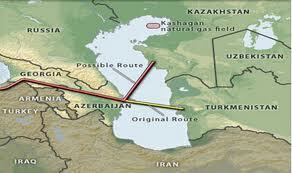 (The proposed Nabucco West would carry gas from the Turkish border to Baumgarten, Austria). “These funds will contribute toward continued work in several important areas during the period running up to the final routing decision, expected in 2013,” said a TAP spokesman. With the Shah Deniz consortium sitting on the fence, other interested parties are also trying to cover all their bets. the European Commission, which had previously said that Nabucco was a priority European project, has backed away. It now says that it does not favor any project or route over another, as long as it carries Azeri gas, would diversify EU supplies, and would reduce EU dependence on Russian resources. Similarly, BP is trying to support both TAP and its rival, Nabucco West. “Our aim is to be involved in all aspects of the project so the aim is to be involved in Nabucco and TAP as well, and this is still being negotiated,” BP spokesman Toby Odone said. Faced with Hungary’s approval of an environmental permit for the construction of the Nabucco pipeline, Gazprom may be considering moving west the route for the rival South Stream pipeline. Reinhard Mitschek, managing director of Nabucco, announced on August 14 that Hungary was the first country to issue the project all its permits. “The granting of this permit is a substantial step forward in Hungary and signifies the advanced stage of development of Nabucco West,” he said. The Croatian side is optimistic. “At the moment the chances are 50:50 that we get the transit route of South Stream,” said a source involved in the Gazprom negotiations. The reasons for changing the route are uncertain. According to the Voice of Russia, a Croatian list serve, Jutarnji, listed a number of possible concerns: lower costs, differences between Gazprom and the Hungarian leadership, uncertainty over ownership shares of various Hungarian companies, and slow work on the Hungarian economic feasibility stateement. Gazprom’s board chairman Alexei Miller minimized these reasons, however, calling them “not significant.” An unnamed Plinacro source added that there could be no official confirmation on the status of the talks, as both sides are bound by a mutual confidentiality pledge. Timing would indicate the talks are retribution for Hungary’s cooperation with South Stream’s rival, Nabucco. Whether the talks will result in the route change, or are merely a pressure tactic on Hungary by Gazprom officials, is yet to be seen. Gaddafi may be gone but Libya is now a country in chaos. Rebel groups are flush with weapons and taking the law into their own hands, persecuting those thought to have been allied to Gaddafi’s regime. Libya’s power vacuum has been filled by heavily armed rebels who still control much of the war-torn nation. Images of the sprawling refugee camps reveal the extent of the country’s destroyed infrastructure. Mohammed Swehli, a commander of one of the major Misratan Rebel Brigades, denies the widespread allegations of torture and abuse. “They’re not bandits, they’re not militia groups”, he says of the rebels. But video after video has emerged of the torture of perceived Gaddafi loyalists, most of them far too gruesome to broadcast. In some cases the brutal treatment appears to be based solely on the colour of the victim’s skin. This report gained rare access to the prisons where thousands are being held indefinitely without charge. One former prisoner shows pictures of his injuries. “This is when they beat me with electric cables. 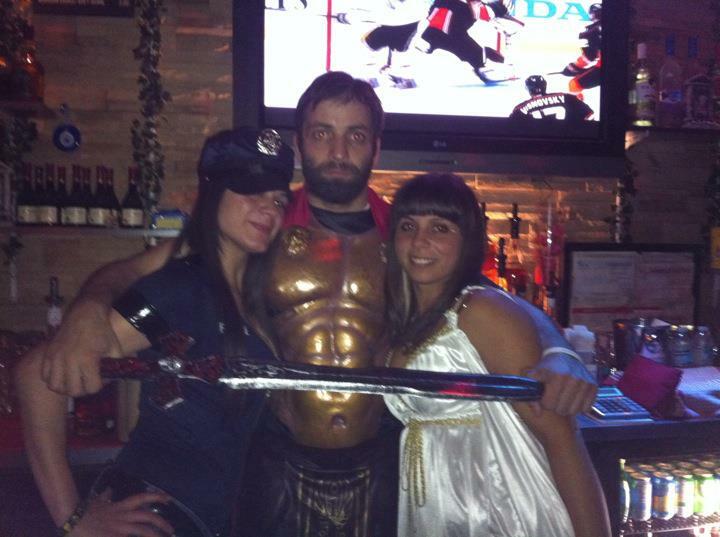 They called me slave”, he says. With upcoming elections and new fears over a split between the country’s east and west, what does the future hold for post-revolution Libya? The Obama administration is contemplating broad military, political and humanitarian intervention to stop a slide toward chaos and Islamic extremism in Mali, the top State Department diplomat for Africa said Thursday. The international but largely U.S.-funded effort to expunge al-Qaeda-linked militants and restore political order in Somalia could present a model for Mali, Assistant Secretary of State for Africa Johnnie Carson said. Since 2007, the United States has spent more than $550 million to help train and supply an African proxy force of about 18,000 soldiers in Somalia, which has brought a measure of stability to the war-torn country for the first time in two decades. Although the United States has not committed to replicating that approach in Mali, Carson and others are holding up the routing of the al-Shabab militia and conducting of elections in Somalia as a template for actions elsewhere. The Somalia comparison offers the clearest view yet of U.S. thinking about the growing terrorism threat from Mali, a landlocked West African country the size of Texas that has imploded politically since a military coup in March. As in Somalia, the threat to the United States and other countries from Mali is wrapped in a larger problem of lawlessness, poverty, tribal friction and weak governance. Somalia adopted a provisional constitution in August, and a new federal government was formed after years of chaos that had fueled terrorism, piracy and famine. Security has slowly improved under the proxy force, which is led by the African Union but bankrolled and trained by the United States, European Union and United Nations. Carson said the internationally backed plan for Somalia’s political reconstruction was working because the country’s neighbors, the United States, E.U. and United Nations had subscribed to a common set of goals. He cautioned that a regional and international consensus would be required for the approach to work in Mali. “There needs to be that kind of a clear understanding there as well,” he said. Mali’s military quickly lost control of the country after the March coup, which was led by a U.S.-trained army captain. Since then, Islamist militias affiliated with al-Qaeda have imposed strict Sharia law in northern Mali and, along with Tuareg rebels, declared an independent state. Hundreds of thousands of refugees have fled their homes. Last week, the remnants of Mali’s central government, France and west African nations led calls at the United Nations for the creation of an African-led force to help Mali confront the militants. The Economic Community of West African States has said it is willing to send about 3,300 troops to Mali if it gets the backing of the United Nations and Western countries. The United States has been leery of a French-backed proposal for quick deployment of an internationally backed African force in Mali, preferring a more comprehensive plan that addresses underlying political problems and tribal divisions. “We want to make sure that it is an African-led international response, and also be very clear that whatever is done out there should in fact be well planned, well organized and well financed,” Carson said. 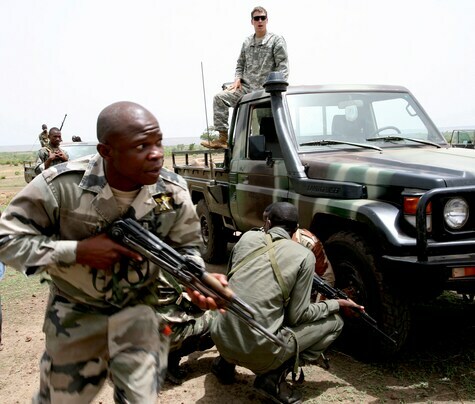 The U.S. diplomat has also said that it is important to enlist support from Mali’s northern neighbors, especially Algeria and Mauritania, which share a long border with the troubled country and have also fought their own long-running Islamist insurgencies. U.S. officials have ruled out sending American combat troops to Mali but have said the Obama administration could help train, equip and transport an intervention force drawn from other African countries. “There will be a need for some type of security response,” Carson said, adding that the United States could support one if it is drawn up correctly. New York,New York — Assistant Secretary of State for African Affairs Johnnie Carson held a briefing at the New York Foreign Press Center during which he discussed the situation in Mali and the Sahel, Somalia and the Democratic Republic of the Congo and answered questions from journalists. MODERATOR: Good afternoon to everyone from the Africa Regional Media Hub of the United States Department of State. And good morning to those joining us from the U.S. I would like to welcome all of our participants. Thank you for joining us. Our speaker today is Ambassador Johnnie Carson, the Assistant Secretary of State for African Affairs. Ambassador Carson will brief us on U.S. foreign policy in Africa as it pertains to the current situation in Somalia, the Democratic Republic of the Congo, and Mali and the Sahel. We will begin today’s call with remarks from our speaker and then open it up to your questions. To ask a question, please press *1 on your phone and you will be placed in the question queue. As a reminder, today’s call is on the record and will last approximately 45 minutes. And now, I will turn it over to Ambassador Johnnie Carson. AMBASSADOR CARSON: Yvonne, thank you very much for the warm introduction, and thank you all for participating in this briefing. I would like this morning to talk about the U.S. participation in last week’s UN General Assembly, where there was significant discussion and debate on issues related to the situation in Mali and the Sahel, Somalia, Sudan, and the Eastern Congo. I’d also like to give you a briefing on some of the Secretary’s activities and some of our own engagement. Last week was an extraordinarily busy week at the UN on African-related issues. Secretary General Ban Ki-moon hosted no less than four regional conferences on Africa – on Sahel, Somalia, Sudan, and the Eastern Congo. Secretary of State Hillary Clinton participated in two of those sessions, one dealing with Sahel and Mali and a second one dealing with Somalia. The U.S. Government was represented at senior levels in the Sudan discussions and in the Eastern Congo, DRC, Rwanda discussions. In addition, the Secretary of State met in a trilateral meeting with President Kabila of the Democratic Republic of the Congo, and also participating was President Paul Kagame of Rwanda. On Friday afternoon, the Secretary also met with Sudanese officials, including Foreign Minister Ali Karti from Khartoum. The Secretary also participated in sessions on HIV/AIDS hosted by the head of UNAIDS and also a session on food security, where we are also very much engaged. Let me talk briefly about the four key areas under discussion last week that the Secretary General hosted and talk about where our policy is with respect to each of those four areas. First on Mali and the Sahel, we in the United States are deeply concerned about the ongoing situation in Mali. We think that Mali is an enormously complicated situation, comprising four separate problems that are interrelated. One is an issue of governance and the need for a return to a civilian elected creditable government, which does not exist and has not existed since the coup d’etat that took place in March of 2012. Second is a political issue related to the Tuareg. That is an issue of political marginalization and a government which has not provided economic and social services to a minority community in northern Mali. The Tuareg feel politically marginalized; this has been a historical problem that dates back prior to Mali’s independence, and it must be resolved politically – not militarily but politically. Third is a very serious problem, a problem that affects Mali and affects the neighboring states as well, and this is the issue of terrorism – terrorism carried out by AQIM – al-Qaida in the Islamic Maghreb Ã? as well as another associated group, MUJAO. Both of these groups have been responsible for the desecration of historical writings and buildings and artifacts in Timbuktu. They are responsible for trying to impose Sharia law on various parts of northern Mali. They are responsible for terrorism, for kidnapping, and for robbery. This is an issue that must be dealt with through security and military means. And the fourth problem in Mali is the issue of the humanitarian situation. Always a food deficit region, it has been further impacted by the failure of rains sufficient this year to meet the needs of the community and by a growing refugee population displaced as a result of the al-Qaida and MUJAO activities in northern Mali. So four very complex problems. Secretary General Ban Ki-moon proposed that the UN establish a position of special envoy to deal with this issue, to coordinate UN activities, to work with the regional governments, and to work with others in the international community. He also said that there would be a strategy developed by the UN that would take into account strategies being worked on by ECOWAS and others in the region. We support the establishment of a UN Secretary General Special Representative for Mali and the Sahel. We support the coordination efforts that would be under this individual. We support the development of a broad-based and comprehensive strategy. And we support the establishment of some kind of a core group or working group that will integrate the work of ECOWAS, Algeria, Mauritania, and Chad – and those three countries are not a part of ECOWAS but have great interest in the situation – as well as the United States, the European Union, France, Great Britain, and Germany, who also have interests there. So we’re very much focused on the Sahel. We think that some progress was achieved with this meeting, and we hope that the Secretary General will move swiftly to mount a special envoy for the region. The second major issues under focus was Somalia. Secretary Clinton also participated in this meeting. Somalia is a good news story for the region, for the international community, but most especially for the people of Somalia itself. Over the past 12 months we have seen the completion of the transitional roadmap ending the TFG and creating a new Somali Government. For the first time in nearly two decades, Somalia has a new provisional constitution. It has a newly selected parliament which is half the size of the former parliament and comprises some 18 percent women and whose membership is comprised of some 60 percent university graduates. There’s been a new speaker selected and a new president elected. Great progress has been achieved in Somalia, and this is in large measure because of the combined efforts of IGAD, the African Union, the UN and the international community, and especially the United States. At this meeting, we heard from Somalia’s new president, Hassan Sheikh Mohamud, and it was broadly agreed that the international community would support the new emphasis in priorities of the government. For our part in Washington, we are determined to do three things. One is to help the new government put in place the infrastructure so that it can run effectively. This means helping to create effective government ministries, have those ministries staffed with effective civil servants and advisors so that they can carry out their government functions. The second is to help to create a new Somali national army, an army that is subservient to civilian and constitutional control, an army that is able to work alongside of AMISOM and take on increasingly new responsibilities that are much broader than anything AMISOM has been equipped and manned to do. But creating a new strong Somali army, to eventually replace AMISOM is a second priority. And third priority is to provide assistance to the government so that it can deliver services to the people so that it can rebuild and refurbish and re-staff schools, hospitals, and medical clinics, provide assistance so that it can begin to deal with some of its smaller infrastructure issues, providing clean water to populations, helping to restore electrical power and also opening up markets. We also want to help in developing small enterprise and microcredit operations to help the government as well. So we will be working there. As I said, Secretary Clinton was there. We think Somalia has made enormous progress. We also believe there has been significant military progress against al-Shabaab. AMISOM deserves an enormous amount of credit in driving al-Shabab out of Mogadishu and its environs and also moving against the city of Kismayo. Much credit for the operations in Kismayo go to the Kenyan forces who were a part of AMISOM, but we must praise the leadership of the Ugandan commanders who have led the AMISOM mission over the last four years. But Uganda, Burundi, Djibouti, Kenya all deserve credit, and they will soon be joined by forces arriving literally today and tomorrow from Sierra Leone to help strengthen AMISOM. But the international community has been in unison with IGAD and the AU, and the U.S. has been a significant and major contributor to this effort. On Sudan, the third issue which was brought up and hosted by Secretary General Ban Ki-Moon – we have seen very great progress there in the last three days. On Thursday evening in Addis Ababa, we saw an agreement signed by President Salva Kiir of South Sudan and President Bashir of Sudan to help resolve a number of outstanding issues related to oil, to revenue sharing, to citizenship, to pensions, and to debt. We recognize that there are a number of issues still outstanding related to Abyei, related to political consultations with respect to Blue Nile and South Kordofan, and to the important issue of humanitarian access to South Kordofan and Blue Nile, particularly in the Nuba Mountains. But progress has been made there in reducing tensions, reopening the borders, and getting those countries back to a position where we can see two viable states living in peace internally as well as with one another. So much discussion on Sudan. We were represented a high level at those meetings by Under Secretary for Political Affairs Wendy Sherman, and we think progress has been forged there. On the Eastern Congo, the last issue that was of great focus in New York last week, there was a meeting that brought together all of the regional Great Lakes states, including Tanzania, Uganda, Burundi, but most importantly Eastern Congo with President Kabila and the DRC, with – sorry – and with Rwanda with President Kagame. Our objectives and the objectives of that conference were to do everything possible to reduce the tensions that exist between Rwanda and the DRC, and to restore trust and confidence between the leaders there, and to do as much as possible to help in the recurring violence that persists in the Eastern Congo, largely as a result of the incursion and the rebellion of the M23. There, we are calling on all states not to support the M23 rebels; to denounce their activities publicly and to contribute as much as possible to the resolution of the problems in the DRC. We believe that it is absolutely critical that the countries in the region respect the sovereignty and the borders of their neighbors, that they not engage in supporting rebel activities across the borders, and that everyone take responsibilities for their action, the protection of their citizens and their resources, the protection of those people who are in their countries, and that they not, in effect, undermine the sovereignty and stability of regional states. IIIÃ ll stop right there and take your questions. OPERATOR: Thank you, Ambassador Carson. We are now ready for the question-and-answer portion of our call. To ask a question, please press *1 on your phone. Please state your name and affiliation before you ask your question. And our first question comes from Drew Hinshaw with the Wall Street Journal. AMBASSADOR CARSON: Thank you for the question. I think that the UN will try to coordinate effectively with all of the players in the region. ECOWAS clearly has a very important role to play. Many of its member states are neighbors of Mali. But we also have to recognize that there are other states in the region that have borders with Mali, whose views also need to be taken into account. And we also must recognize that there is an international dimension to this issue, and so there are reasons to make sure that the wider views of the international community are there. ECOWAS has played a very valuable and important leadership role, but it is important to make sure that the views of Algeria are included. Algeria has a long border and history and relationship with Mali. The views of Mauritania are also critical, valuable, and important. 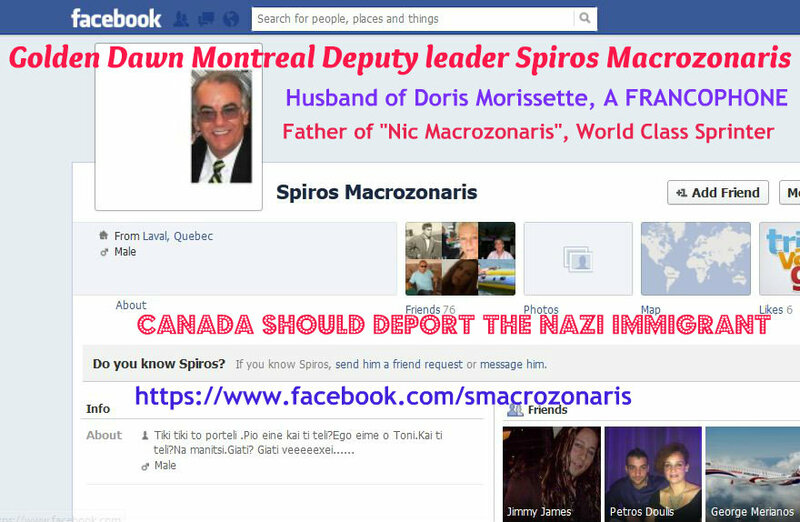 They too share long borders with Mali. And in fact, Libya also is a critical player because they too have shared borders and shared interests there. All three of those countries – Algeria, Mauritania, and Libya – are not a part of ECOWAS. And in addition, countries like Chad have an interest and they are not a part of ECOWAS. The United States, France, the European community also are concerned about the situation there, and their views should be taken into account. I stress that in the case of Somalia, where we have seen enormous progress over the last 12 months, and in fact, continuously over the last three, three and a half years, there has been a clear commitment by all who were engaged there to follow a common strategy and adopt a set of common views. EGAD and the East African community, who are the most important players around Somalia, the AU, the U.S., the UN and others have all had a common position. And I think that’s why Somalia has achieved so much success over the last 12 months in terms of moving to a more permanent government and making the strides in success against al-Shabaab. We look to try to have the same kind of both regional and international cooperation on Mali. OPERATOR: Thank you. Our next question comes from the U.S. Mission in Kampala. Please state your name and your affiliation. QUESTION: I am Julius Odeke from Kampala. I work with The Independent magazine. My question to Assistant Secretary is that initially, America was looking for a base to be stationed in Africa, but they recently they said they will not do that. Is that a sign that America is withdrawing from its military engagement in Africa? AMBASSADOR CARSON: Julius, thank you very much for your question. I think you are referring to AMISOM, and I can say that there is at this moment no – and I repeat, no – intention to have an AMISOM headquarters located in Africa. AMISOM is located in Germany, and at this point its headquarters is likely to remain – sorry – I’m sorry – AFRICOM. I’m saying AMISOM; I should have said AFRICOM. AFRICOM is located in Stuttgart, Germany, and there’s no intention to move the AFRICOM headquarters outside of Germany at this point. I said AMISOM; I meant to say AFRICOM. MODERATOR: Thank you. Our next question comes from Tanzania. Please state your name and your affiliation. QUESTION: My name is (inaudible). I work for the Tanzania (inaudible) newspaper. My question first of all is about the shift of America’s – or U.S. foreign policy. We have seen a lot of attention paid to Africa. We want to know whether there is any serious concern that what is going to be achieved is going to have an impact on the development of the region. Thank you. AMBASSADOR CARSON: Yes. Thank you very much for the question from Tanzania. The United States has just recently published a new strategy for Africa. It was published in June of this year and is available on both the White House and the State Department website. That strategy for Africa is very clear. It says that we want to develop our friendship with Africa based on mutual respect, mutual interest, mutual responsibility. We want to base it on a partnership and not patronage. We want to elevate Africa’s importance in the international arena and we want to achieve – work with Africa to achieve four strategic objectives. One is to strengthen democratic institutions and good governance. The second is to spur economic growth, investment, and trade between the United States and Africa. But we also want to help spur economic growth and trade amongst African states as well. Third, we want to help to bring about greater peace and security across the African continent. And in this area we continue to work with the international community – the UN, and others – to bring about greater peace and stability in places like Somalia, Sudan and South Sudan, and the Eastern Congo. And we will continue to work towards promoting peace, security, and stability in Africa. And fourthly, we want to work to help promote development and greater opportunity for all of AfricaaaÃ?s citizens, and there we will continue to focus on a number of priorities under the Obama Administration, including but not inclusive or exclusively working on things like Feed the Future, which is a program to help promote a green agricultural revolution across Africa, to end food insecurity, to grow agro industry. And we will also work on public health issues through our Global Health Initiative, working to combat HIV/AIDS, malaria, tuberculosis, cholera, and to help build Africa’s public health institutions so that they are better able to provide services to their people. But we will do this through our USAID missions, we will do this through our centers for disease control, we will do this through the Millennium Challenge Corporation which provides multimillion dollar grants that are used to deal with major economic development and infrastructure challenges. But those are the four things that we will continue to work on. MODERATOR: Thank you. Our next question comes from Kigali, Rwanda. Please state your name and affiliation. QUESTION: Thank you very much, Ambassador Carson. My name is Edmund (inaudible). I work for the East African Nation Media Group. My question is about the Congo. I saw in the news in the morning that the U.S. Government has asked Rwanda to denounce M23 rebels. It appears there’s no one asking the DRC Government to address its internal issues, particularly the ones M23 are fighting for. I believe some of the issues they are asking the DRC Government to address are legitimate. So the way forward now, what is the position of the U.S. Government towards the issues inside the DRC? Are we going to see the U.S. Government asking DRC to address the issues now that we see in the papers that (inaudible) speaking Congolese feel that a genocide will happen soon? Thank you. AMBASSADOR CARSON: Thank you very Ã? Edmund. Thank you very much for that question from Kigali. First of all, our desire is to see peace and security and development in the Eastern Congo just as we see peace and security and development occurring in Rwanda, in Uganda, in Tanzania, and other neighboring states in the Great Lakes. We seek for the people of the Eastern Congo what you enjoy in Kigali, what people enjoy in Tanzania, in Lusaka, in Kampala. Each of these states in the region have responsibilities, and their leaders have responsibilities. In the DRC, President Kabila clearly has the responsibilities. His challenges are great, but his responsibilities are equally important. President Kabila, amongst other things, must in fact protect all of the Congolese citizens irrespective of their ethnicity and their language, and this includes the large Banyamulenge and Rwandaphone populations that exist there in both South Kivu and in North Kivu. He has that responsibility as the president of his country. He also has the responsibility to protect women and girls. We know that the Eastern Congo is probably the most violent place in the world for girls and women to live. There must be better protection of the rights of women. He has a responsibility to go after and to eradicate all armed rebel groups operating in his country Ã? the exFARfar, the Interahamwe, the FDLR, and also the M23 as well. They are rebels. 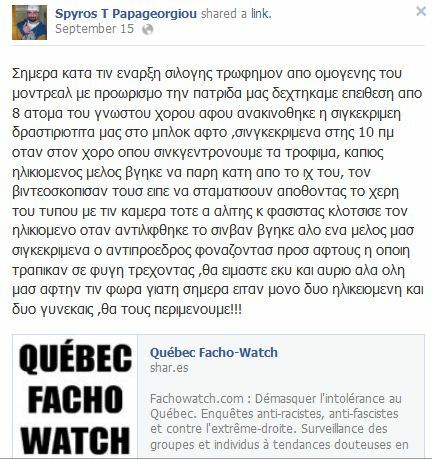 They are a dissident group. He has a responsibility to ensure that the minerals of his country are exported and handled in a transparent way and that they are not the source of corruption or misuse. He has the responsibility to improve dramatically his security services so that they protect people and not prey on them. All of these are responsibilities that President Kabila has in his country. But let me also say that there are responsibilities for the neighboring states as well, and those responsibilities are clear. They are not to support rebel groups operating against the country or a neighboring country. It’s not to train or to politically influence or to ship arms to rebel groups that undermine the security of a neighboring state. And it is not and should not be too much to ask the Government of Rwanda to denounce a rebel group that is preying on the lives of people or undermining the stability of a neighbor. So the call for the Government to reject the territorial and political and rebellious ambitions of the M23 are not and should not be too much. The M23 is led by individuals who are ICC and IT. 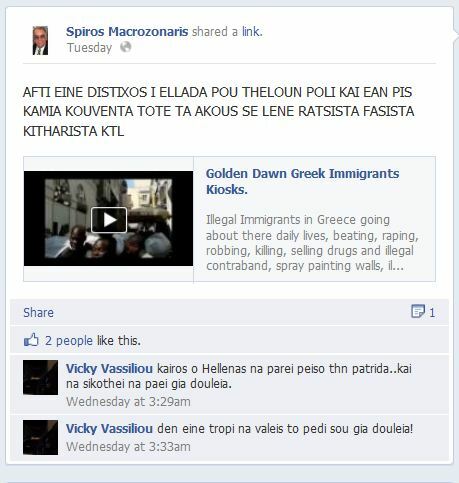 They’re led by people whoooÃ?ve carried out serious human rights violations. So it should not be too much to ask the Government of Rwanda to do this, to ask that. 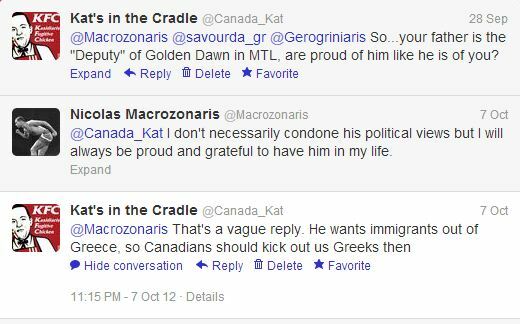 And that’s a responsibility on that side of the border as well. There are responsibilities held by all, and it is when everyone exercises those responsibilities appropriately and correctly and transparently that we have peace and stability. It is important that tensions be defused between the regional states, including Rwanda and the DRC, that trust be restored between these two countries, and that confidence be rebuilt. And so each country has responsibilities, and when those responsibilities are lived up to, we have a greater chance for peace, stability, and the harmony that can and should exist throughout that region. OPERATOR: Thank you. Our next question comes from Jo Biddle. Please state your affiliation. QUESTION: Good morning. Jo Biddle from Agence France-Presse, phoning in from the State Department. Thank you very much for organizing this call. Last week I was at Ã? I watched the Sahel meeting that was happening in the United Nations, and there were many calls from African countries, supported by France, for a military force to go into Mali and try to flush out the rebels, the Islamic rebels that are spreading terror in that region. You mentioned that you thought the issue of the Tuareg was Ã? should be resolved politically and not militarily, but on the Islamic side of things, is the United States going to support a military ECOWAS-led mission for the Sahel region, and – yeah, could you talk to that, please? AMBASSADOR CARSON: Let me – thank you very much for the question from Agence France-Presse. The – all four issues that I mentioned earlier are critical, and they must be done simultaneously. It is absolutely critically important for there to be democratic progress in Mali, that there be a restoration of the civilian democratic constitutional government, and that needs to be done as soon as possible. It needs to occur alongside of progress in these other areas. But let me tell you why I start there, because if you donnnÃ?t have a strong, creditable government in Bamako, the ability to negotiate a political solution with the Tuareg, one that has credibility, one that will be carried out, will be weakened. If you don’t have a strong, creditable government in Bamako, it will be difficult to have a military which is capable of leading as it should the liberation in the northern part of the country. Any ECOWAS military activities in Northern Mali should, in fact, have the Malian military as the lead and ECOWAS fighting alongside of it. But it is not just ECOWAS. It is important that what goes on up there have the support of all of the states in the region. The ECOWAS states, as well as Mauritania and Algeria and others in the area, must also be a part of this policy. After all, the states in the north have long borders with Mali. But yes, I say that there will have to be, at some point, military action to push the AQIM and the MUJAO out of the north and out of the control that they are exercising over towns like Timbuktu and Kidal and Gao. But any military action up there must indeed be well planned, well organized, well resourced, and well thought through. And it must, in fact, be agreed upon by those who are going to be most affected by it. So it is not something that should be taken lightly. There were strong calls, including from France, for action to be taken. We, too, in Washington have been appalled by the destruction of many of Mali’s valuable historical texts, by the destruction of mosque and historically important buildings, and by the attempt to impose extremist ideology on the communities. Clearly, some action must be taken. But as I said, it should be well planned, well organized, well executed, and well resourced. I think this is important. All of these things must be done. They must be done simultaneously. But it is imperative that things move forward democratically in Bamako and that we see a restoration of democracy there. If we don’t have that, it will not – the other activities will not be nearly as effective and strong. All things must be moved simultaneously. OPERATOR: We now have time for one more question, and that comes from Kevin Kelly with the Nation Media Group. QUESTION: Yeah, hi. Thanks very much to Ambassador Carson for agreeing to do this, but I actually have two questions. One pertains to his mention before about the United States helping to build a Somali national army. I’m wondering if you could give me details on that, what the timetable and the funding might be for that. And related to it, do you have concerns, Ambassador Carson, about what will happen next in Kismayo? Do you see that the Kenyan presence there might be interpreted eventually as an army of occupation? As you well know, there’s a lot of nationalist feeling in Somalia that outsiders are not generally welcome in these circumstances. Thanks a lot. AMBASSADOR CARSON: Thank you very much for those two questions on Somalia. First of all, we applaud the work of AMISOM and what they have done in helping to degrade and defeat and push al-Shabaab out of Somalia’s main cities and towns. We believe that this will help to bring about a return to stability in Somalia and will reduce, over time, the terrorist threat to Somalis and to neighboring states. We believe that the Kenyan role in liberating the south as a part of AMISOM is important and deserves the support of both IGAD, the African Union, and the international community. We recognize that Kismayo is comprised of a number of clans and sub-clans in Somalia, and that there will be clan competition. We hope that the Kenyan presence there will not be seen as an occupying force, and that the government in Mogadishu, working alongside of AMISOM and the UN, will go in very quickly and establish political stability and a political system that takes into account the various clan and sub-clan interests. The Kenyan presence is not intended to be a military occupation. It is intended to be a part of a temporary – a very temporary liberation strategy that quickly allows Somali leadership to take control. And this leadership should come from Mogadishu, should come from the new government led by President Hassan Sheikh Mohamud. I think that the Kenyans have no interest in trying to establish political authority there. They simply want to help drive out al-Shabaab, help liberate the country, help create the stability that has been long absent. But we hope that the Somali Government will move in quickly, working with IGAD to restore the political leadership that’s important for running Kismayo. But this has been a major step forward. We should applaud what has been done. 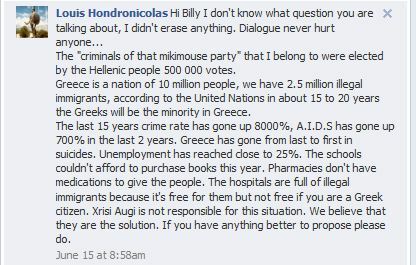 And we want to work to encourage the political forces to move in to help stabilize the situation. On this – on the first question that you asked, we have in Washington been strong supporters of AMISOM, major contributors to the AMISOM effort, largely by training and equipping AMISOM battalions that have gone into Somalia to help fight the al-Shabaab. Going forward, we would anticipate that most of our new and additional resources, as they come to us, will be directed at helping to train and provision a new Somali military, not to continue to expand AMISOM. The focus should be on creating a national Somali army that will take over from AMISOM and will assume the responsibilities of providing national security and defense for the nation. I do not at this time have any dollar figures that I can share with you on what we would be providing to the Somali Government to train Somali military forces. We have done some of this in the past. We have trained small units of Somali TFG troops in Bihanga, Uganda at a military camp. We would expect that we will, over time, continue to do this and expand it and to make more of the training local in Somalia for both cost effectiveness and for political reasons. But we look at the focus going forward being directed at strengthening the Somali national military and not expanding the AMISOM effort, which has been extraordinarily valuable and important. MODERATOR: That concludes today’s call. I would like to thank Ambassador Johnnie Carson for joining us, and thank all of our callers for participating in today’s call. I know many of you did not get the opportunity to ask your questions, so if you have any questions about today’s call, you can contact the African – the Africa Regional Media Hub at AFMediahub@state.gov. Thank you.